"Concentrating photovoltaic (CPV) systems leverage the cost of high efficiency multi-junction solar cells by using inexpensive optics to concentrate sunlight onto them," said Noel C. Giebink, assistant professor of electrical engineering, Penn State. "Current CPV systems are the size of billboards and have to be pointed very accurately to track the sun throughout the day. But, you can't put a system like this on your roof, which is where the majority of solar panels throughout the world are installed." Giebink notes that the falling cost of typical silicon solar cells is making them a smaller and smaller fraction of the overall cost of solar electricity, which also includes "soft" costs like permitting, wiring, installation and maintenance that have remained fixed over time. Improving cell efficiency from about 20 percent for silicon toward greater than 40 percent with multi-junction CPV is important because increasing the power generated by a given system reduces the overall cost of the electricity that it generates. To enable CPV on rooftops, the researchers combined miniaturized, gallium arsenide photovoltaic cells, 3D-printed plastic lens arrays and a moveable focusing mechanism to reduce the size, weight and cost of the CPV system and create something similar to a traditional solar panel that can be placed on the south-facing side of a building's roof. They report their results today (Feb. 5) in Nature Communications. "We partnered with colleagues at the University of Illinois because they are experts at making small, very efficient multi-junction solar cells," said Giebink. "These cells are less than 1 square millimeter, made in large, parallel batches and then an array of them is transferred onto a thin sheet of glass or plastic." To focus sunlight on the array of cells, the researchers embedded them between a pair of 3D-printed plastic lenslet arrays. Each lenslet in the top array acts like a small magnifying glass and is matched to a lenslet in the bottom array that functions like a concave mirror. With each tiny solar cell located in the focus of this duo, sunlight is intensified more than 200 times. Because the focal point moves with the sun over the course of a day, the middle solar cell sheet tracks by sliding laterally in between the lenslet array. "The vision is that such a microtracking CPV panel could be placed on a roof in the same space as a traditional solar panel and generate a lot more power," said Giebink. "The simplicity of this solution is really what gives it practical value." Because the total panel thickness is only about a centimeter and 99 percent of it—everything except the solar cells and their wiring—consists of acrylic plastic or Plexiglas, this system has the potential to be inexpensive to produce. Giebink cautions, however, that CPV systems are not suitable for all locations. "CPV only makes sense in areas with lots of direct sunlight, like the American Southwest," he said. "In cloudy regions like the Pacific Northwest, CPV systems can't concentrate the diffuse light and they lose their efficiency advantage." 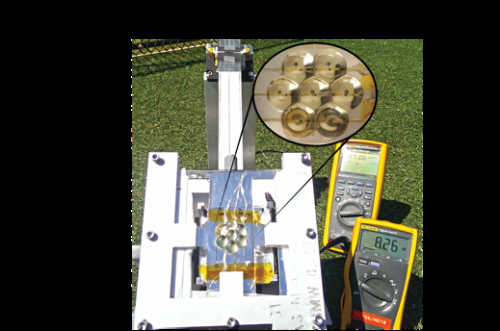 The researchers tested their prototype concentrator panel outside over the course of a day in State College, Penn. Even though the printed plastic lenses were not up to specification, they were able to demonstrate over 100 times solar concentration. Put one on a house for a year without anyone babysitting it and see if it still works. I'm betting it won't. The same could be said for any prototype.